We woke up early to a cool morning, with Rowan super excited to get to our destination for the day: Tokyo Disneyland. It was rush hour when we jumped on the subway at 8:30, which meant crowded cars and standing for the half hour journey, along with locals dressed in suits and fancy shoes on their way to work. After getting off at Maihama station, one of the first things you notice that’s a little different about Tokyo Disneyland is the number of teenagers and adults who dress as their favourite characters. That, and the vast number of groups of six or eight teenage girls, who wear the same outfit (say, animal print shorts, a black sweater and pink bunny ears; or black kilt, short socks, loafers, fluffy pink sweater and red Minnie Mouse bow), or our favourites, the group of young adults (men and women) dressed in bright green overalls and wearing plush dinosaur masks. They all seemed to have a ball and it’s a lot of fun to see them walking around -kind of like Halloween, but for grown ups. Star Tours Concourse on the Star Tours: The Adventure Continues. 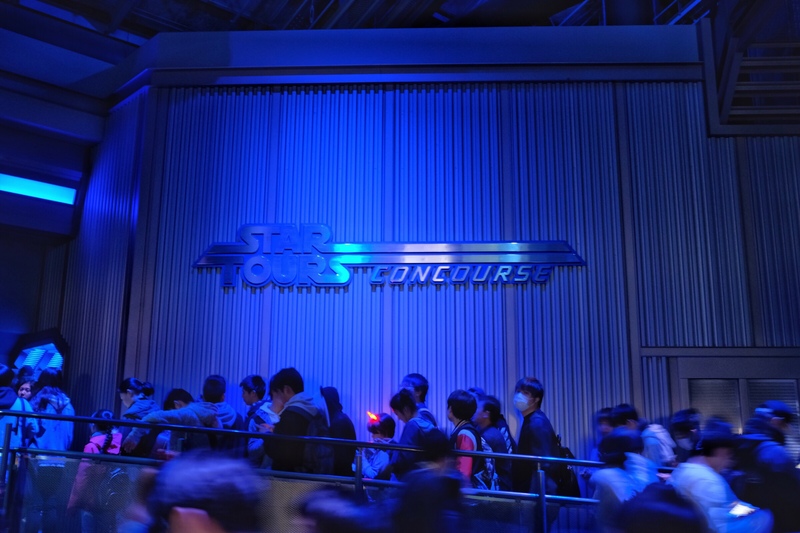 The first ride we hit was Star Tours in 4D, that had us in a shuttle craft, piloted by C-3PO with the help of R2-D2, sneaking off an Imperial Star Destroyer. Kylo Ren tried to stop us in the launch bay using the Force, but C-3PO managed to break away and shoot our way through some Tie Fighter fire, before launching us into hyperspace. Then he abruptly landed us on three different planets, only to have to turn away each time because of Imperial stormtroopers or other hazards. Each time he flew off or tried to land, the shuttle lurched and dove, which made me feel incredible nauseated. Rowan and Kevin, happily, were just fine. Even with my rolling stomach, though, the ride was incredible, and well worth the half-hour queue, even when all the narration was in Japanese. Captain Jack Sparrow hanging out in the Pirates of the Caribbean. Next we lined up for our favourite, Buzz Lightyear Astro Blasters, which Rowan still remembers from Hong Kong Disneyland when he was 3 (! 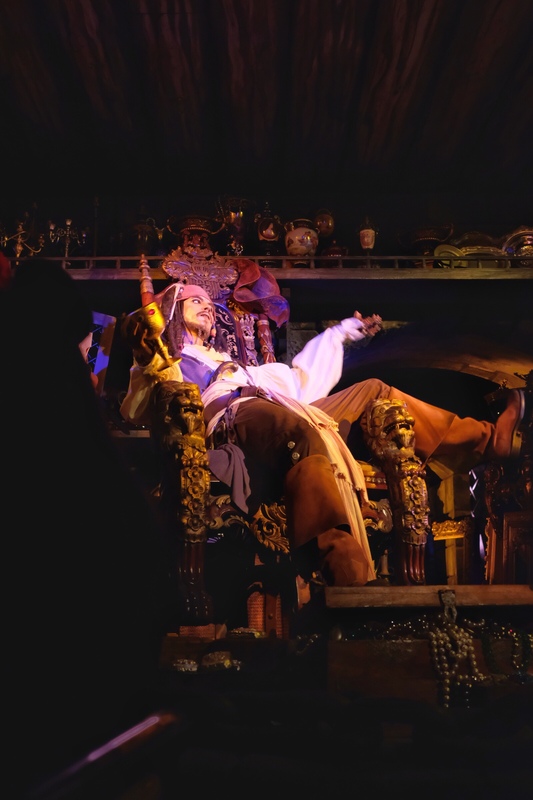 ), then the Pirates of the Carribbean ride, which we all loved and just hade to ride more than once. 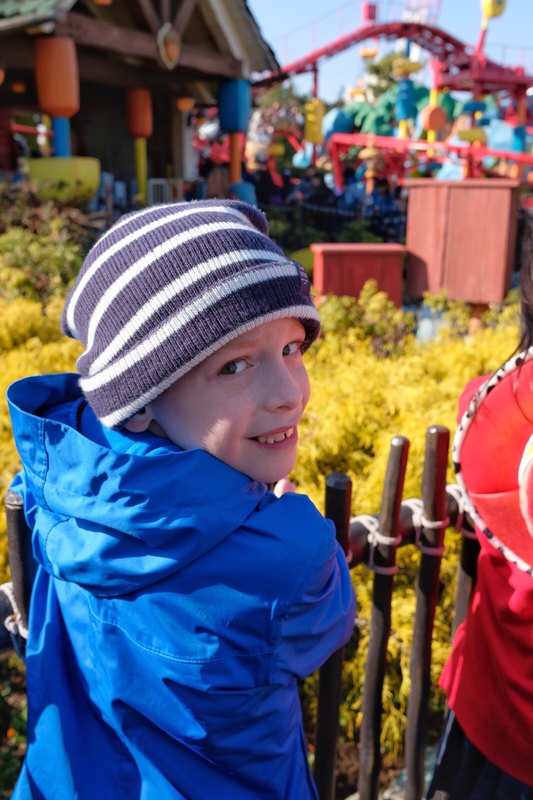 Rowan waiting patiently for Gadget’s Go Coaster. Between those, a Jungle River Cruise, which was super entertaining, a Snow White and the Wicked Witch ride, and a small roller coaster in the little kid area (filled almost entirely by adults), before we knew it, we’d been at the park for 8 hours and we just couldn’t take standing in any more line-ups. A hot bowl of vegan noodle soup from T’s TanTan. 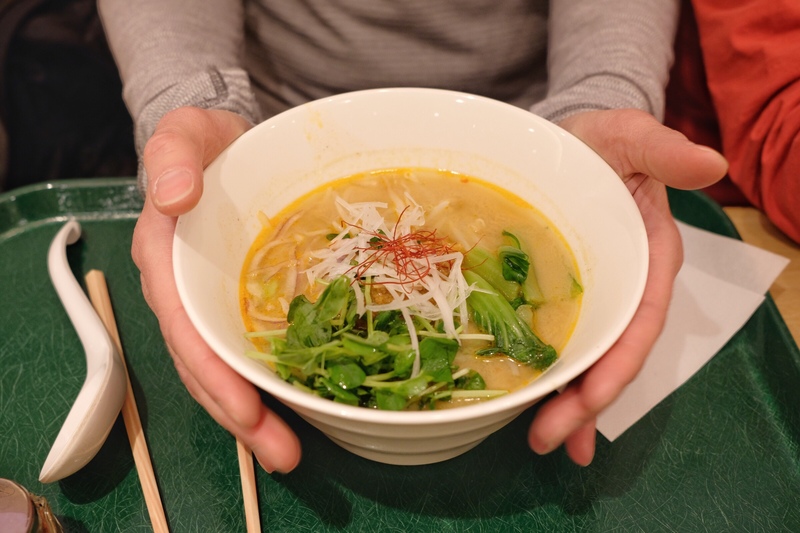 We stopped in our favourite vegan noodle place in Tokyo station, before heading back “home” to pack for the next leg in our trip: Nagano, and hiking in the Kiso Valley. Do they still have the Subway “pushers”? They help squeeze you into the cars like sardines! I read about that qite a few years ago. Too bad you didn’t get a pic of the silly girls, would have loved to see them. We went to Disney in Florida a million years ago and unfortunately did one of those rides, John became so nauseated that we even had to cancel our dinner plans that night. We haven’t seen the subway pushers. Apparently they’re on the very busy lines during rush hour, which we haven’t experienced (I don’t think the line getting to Disney was a major one). The way we put together these posts is I do the writing and Kevin adds the pictures, all of which only he’s taken. So I never know if what I’ve thought of as interesting is what he’s thought of as interesting! Usually our perspectives seem to converge, but either he didn’t think the silly girls were interesting, or he felt weird photographing them! I feel for John! I’m not sure I can do rides like that anymore!